Our new 2018 mid-size Saturn inflatable catamaran MC330 is a size step up from our mini-cat MC290 and is better suited for larger vessels as a tender or transfer boat. It's also a great fishing/diving boat and offers maximum portability with 5 separate inflatable chambers. The MC330 is a very stable boat and is perfectly suited for either a small outboard motor or with an inexpensive electric motor. Although the boat is very sleek and stable it is not intended to be a sport racing boat. It was designed for leisure boating activities and does not have sponsors or fiberglass wings as you would find in the XCAT style racing boats. Care should be taken when using a gas outboard to limit speeds especially in strong wind conditions as the boat could flip if raced or improperly operated. As with any other watercraft, always wear a life jacket and use an outboard lanyard kill switch when going fast. All of our custom Saturn MC catamarans include our fully removable high-pressure air deck floor. The floor is rated at over 6 psi and is incredibly rigid for an inflatable floor. This maximizes comfort and stability and allows easier transportation and storage as the floor can be stored separately. The increased diameter tubes provide greater performance and stability and the lowered front bow allows swimmers to easily get into and out of the water when swimming. The splash plate on the back of the transom minimizes splashes from an outboard motor and our directional fins on the bottom help with tracking and directional stability. Portable, sleek design which makes it extremely lightweight. Quick and easy inflation and deflation. Attractive sporty look which will turn heads! Extra wide rub strake along tubes bottom. Easy planning with a small electric motor. 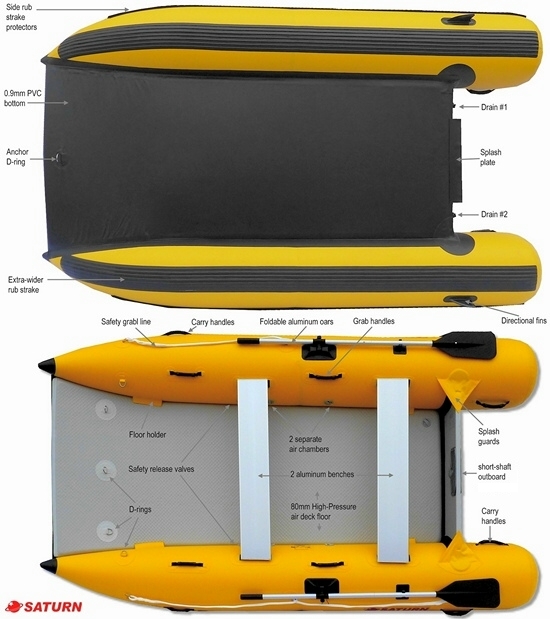 High-pressure drop-stitch inflatable air deck core floor (rated over 6 psi). Two air chambers per tube for increased safety. Air pressure safety relief valves on each tube. 2 small fins for better directional tracking on bottom of tubes. Marine grade plywood transom with 2 drain plug. Included: Free hand pump, repair kit, set of oars, 2 aluminum benches and carry bag. 52" x 28" x 12"